Text: Alan Bulmer Lead image: Maruska Laboratories. Like humans, most bony fish experience the world around them using the classic senses of sight, hearing, taste, smell and touch. However they have an additional sixth sense, related to a structure called the lateral line, that is more sophisticated than touch and it is this sense which is very important to anglers. The lateral line system is responsible for the sixth sense which allows fish to detect movement around them and changes in water flow. Detecting movement helps fish find prey or escape from predators. It also allows fish to detect changes in water flow and choose where to swim. For anglers, how a fish perceives a fly or lure using its lateral line system will likely dictate whether a fish will actually eat it. All of us have cast at a fish which spurns every fly presented to it or seen fish following a lure almost to the rod tip before veering away. It is very likely that in both instances the fish ignored the offering because the pressure waves that it detected from the fly or lure using its lateral line alerted it to the fact that the prey object is not what it seemed initially. Some researchers suggest that it is the lateral line which allows fish to become at one with their immediate environment and sense anything that is not normal. This is a more likely reason for fly or lure refusal than fish having the cognitive capacity to learn to avoid lures by sight. To understand how the lateral line works it is important to understand its structure and how pressure waves stimulate a response. Because water is so dense, it propagates pressure waves very well. The lateral line “sense” detects and interprets these pressure waves and this allows fish to become aware of very low frequency vibrations such as those generated by a tail beat or nearby relative movement. The best description I’ve read about how this works is “to understand the detection of relative movement by pressure wave perception, move your hand slowly toward the top of your desk without quite touching it. If the air was dense enough, and your hand sensitive enough, you could feel the higher pressure above the desk relative to the lower pressure at the edge where the air could flow away. This is how the lateral line works in fish and why it has been termed “distant touch”. For the lateral line sense to work, either the fish, the object it is detecting, or both must be moving”. Experimental evidence suggest that the lateral line sense can be quite precise in detecting relatively small objects, but primarily at close range. Under poor visibility conditions, which are quite common underwater, the lateral line sense becomes extremely valuable in feeding. The receptor for the lateral line system is the neuromast. This small structure consists of a flexible, jellylike cupula resting on a mass of sensory cells. The sensory cells have hairs embedded in the cupula. This is shown in the image below. A pressure wave causes the cupula to move and the hairs transmit the direction and extent of movement to the sensory cells which then generate nerve impulses. These impulses carry the information to the brain where it is interpreted. 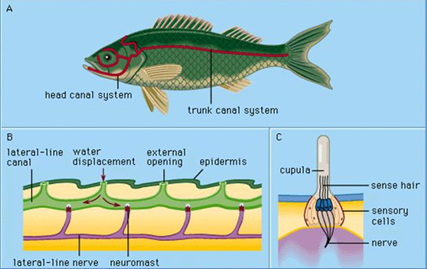 Neuromasts may be located on the skin, in pits, or in canals that run in the superficial bone of the head and through the scales along the side of the fish. Amazingly the lateral line system also enables a fish to detect a motionless object by the movement of water deflected by that object. The way that a fish detects an object with its lateral line and the way you hear music with your inner ear are quite similar. Both processes share the same basic mechanism, sensory cells with cilia detect vibrations and send this information to the brain. Bony fishes have a fully developed lateral line system and this extends along each side of a bony fish’s body. As moving water presses against the fish’s sides, nerve impulses from the ciliates sensory cells within the lateral line permit the fish to perceive its position and rate of movement. The oscillations perceived by the lateral line receptors are in the low-frequency spectrum range: from 1-5 to 100-200 Hz. There are two types of neuromasts and each is receptive to different frequency oscillations. The canal neuromasts are most sensitive in the higher frequency range of 20-30 to 100 Hz. The free neuromasts are most sensitive to oscillations with the frequency from 2-5 to 10-15 Hz. The zones of sensitivity of the lateral line and auditory organs partly coincide. However, the basic difference between the lateral line and auditory systems is that the lateral line responds to shift waves whereas the auditory receptors respond to pressure waves. Sound pressure waves cannot be perceived by the lateral line as the fish body is acoustically transparent. The lateral line is characterised by high sensitivity in most fish. For example, free neuromasts can respond to weak water currents as small as 0.03 millimetres per second and canal neuromasts can detect alterations in current speed from 0.3 to 20 millimetres per second. As you would expect sensitivity is strongest to oscillations parallel to the body surface. Rapidly swimming fish or fish living in water currents generally have their lateral line neuromasts hidden in canals to shield them from lower frequency hydrodynamic noise caused by active swimming or holding in turbulent currents. The lateral line as a sensory system is only efficient at relatively small distances. For example, it has been determined experimentally that fish respond to small immobile objects at a distance of several millimetres to several centimetres. This can however increase to dozens of centimetres for large objects. Typically the maximum distance from the source of oscillations at which the fish could perceive it does not exceed one body length. A calmly swimming fish generates oscillations with the frequency from several Hz to 10 Hz but sharp drops and sudden alterations of direction induce oscillations with a frequency up to 100 Hz. Plankton invertebrates generate oscillations with a frequency from several Hz to 30-40 Hz which lies in the range of the maximum sensitivity of the fish feeding on them. Apparently some predators can even detect the current from the syphon of a mollusc (which can be between 6 to 14 centimetres per second) and use this to home in on prey. Predators can determine the size, speed, direction and perhaps even the species of an actively moving fish from its hydrodynamic trace. That is the pressure waves generated by movement. Torpedo and arrow body shapes give off less pronounced oscillations when moving through the water than sinuous eel like shapes. As you can see from the image above the same thing happens in reverse with potential prey sensing imminent predator attack. Some predatory fish, such as pike, go to great lengths to disrupt their hydrodynamic fingerprint when hunting prey by moving in short bursts and pausing in between spurts. Only when they near the target do they accelerate to full speed and by then it is probably too late for the prey to escape. Experiments have also shown that fish rely on sound and sight to detect prey and approach it whereas the final strike and catching of the prey is mostly based on the lateral line. However, when the water clarity is poor or in low light the importance of the lateral line in locating prey becomes critical. Another thing which is fascinating is that some fish can find active objects in the bottom substrate by sensing vibrations via their lateral lines. In fish specialising on feeding on falling insects, such as trout, the lateral line provides for not only the information about the prey but it also allows the fish to determine the distance to it. The mechanism of precise detection is associated with the distribution of the surface waves created by the insect and the ability of the fish to perceive and analyse these oscillations. On the whole, the speed of the surface waves is more than 1000 times slower than waves distributing in the water column and as these waves hardly penetrate into the water column it allows fish feeding on insects to hold with their head firmly in the surface film. Typical wind generated surface waves contain only frequency components below 10 Hz. In contrast an insect struggling at the surface creates concentric surface waves that have frequencies up to about 100 Hz. This difference allows fish to differentiate the struggle of an insect from the background hydrodynamic noise, especially in low light conditions. One of the things that became apparent when researching this article was how small changes in pressure wave frequency could make fish wary of taking a lure. Changing treble hooks for singles, replacing split rings or increasing the gauge of hooks used could completely change the pressure wave “fingerprint” and attractiveness of a particular lure. Even minute changes to the shape of lures which occur in the manufacturing process could be sufficient to make one lure perform better than another. Have you ever lost a successful lure and replaced it with one seemingly identical only to have nowhere near the same success? This may explain why. Perhaps lure makers should, as part of the “tank testing” process, record the wave frequency when each lure is retrieved at a certain speed. This would allow the angler to select lures which generate pressure waves at a specific point in the frequency range 1-200 Hz to try and take advantage of the lateral line response. If you knew wave the frequency range that each lure generated then it would be very easy to experiment to see which lure worked best on any particular day. If you dig then this information is already available for some lures. For example, the Rapala F-11, has the same dominant frequency (~ 5 Hz) irrespective of the retrieve speed whereas others, such as a Rapala jointed minnow, can have a dominant frequency between 7 – 15 Hz depending on lure size and how fast it is retrieved. A similar phenomenon probably happens with flies. If the pressure wave frequency of the artificial does not match the natural flies on which the fish is feeding then it will be ignored, irrespective of how accurately it seems to mimic what is hatching. Sometimes the more ragged and beaten up a fly becomes the more attractive it is to fish. My bet is that as the fly becomes sparser it’s pressure wave fingerprint moves closer to the natural flies that the fish are actively feeding on. 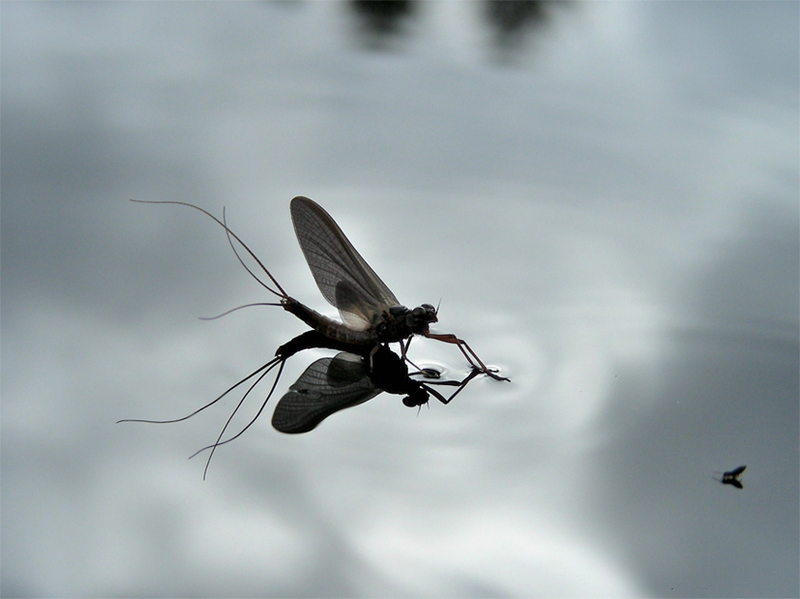 Just as with lures, no two flies are identical even though to the naked eye they may appear so. Subtle changes to things like fibre lengths, dubbing density, shape and weight will all alter the pressure wave characteristics of the fly and make it perform slightly differently to another tied in the same manner. This is likely to be why some flies tied to the same pattern are more successful than others although it is probably more important in slower moving stretches where fish have more time to locate and intercept potential food items than in faster, riffly water. It is a factor worth considering nonetheless. Interestingly, the early masters, such as Skues and Halford, went to great lengths to try and tie flies exactly the same and perhaps they had unwittingly stumbled onto the importance of the hydrodynamic fingerprint to how a fly is perceived by the lateral line system of a fish. I wonder whether it is worth tying sparse to bulky versions of the same fly pattern to see whether it makes a difference when a difficult fish is encountered? There has been more research into the lateral line system of fish over the past 20 years then ever before and much of this is down to advances in the analytical equipment. It will be fascinating to see what else is revealed in the future and how this can be used to improve angling performance. “The Lateral Line in Fish: Structure, Function and Role in Behaviour”. A.O. Kasumyan. Journal of Ichthyology, Vol. 43, Suppl. 2, 2003, pp. S175 – S213. “Lateral line system of fish”. H. Bleckmann and R. Zelick. Integrative Zoology 2009; 4: 13-25. “Knowing Bass – The Scientific Approach to Catching More Fish”. Dr K.A. Jones. ISBN 1-59228-616-X. First Edition 2002. Really interesting read. For such an important sense to the fish, it’s so often overlooked by us anglers.